Michael Schumacher has called off his eagerly-anticipated Formula One comeback with Ferrari because he has not recovered from a neck injury he sustained in a motorcycling accident earlier this year. 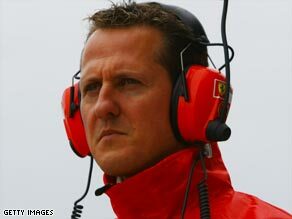 Last week, he told his Web site www.michaelschumacher.de: “I only have to admit that my neck pinches a bit. We have to get a grip on that as health has priority — that’s the clear arrangement made with Ferrari and, by the way, with my wife, too,” Reports in Italy’s sport newspaper Gazzetto dello Sport say that Ferrari test driver Luca Badoer will now replace Massa in Valencia. Massa is recovering in Brazil from the serious injuries he received in a freak crash in qualifying for the Hungarian Grand Prix and is set to miss at least four races. Schumacher has worked as a special adviser to Ferrari since his retirement from Formula One in 2006, after winning five championships during his time with the team to add to the two he won at Benetton. His seven world titles surpass the five won by the Argentine legend Juan Manuel Fangio and his tally of 91 grand prix wins from 250 races is also a record. Schumacher broke the news that he would not be returning to Ferrari president Luca di Montezemolo and team principal Stefano Domenicali on Monday evening. His decision followed a further thorough examination of the extent of his neck injury.